Sony Xperia XA1 Ultra case,Yiakeng Shock Absorbing Dual Layer Protective Fit Armor Case Cover Shell For Samsung Xperia XA1 Ultra Dual, Sony G3212, Sony G3223 6"
This Double Layer hybrid Defender Armor case supply stylish and dual layer defense for your new mobile phone against abrasion, scratches, dirt, damage, and damages.and anti-fingerprints defense. 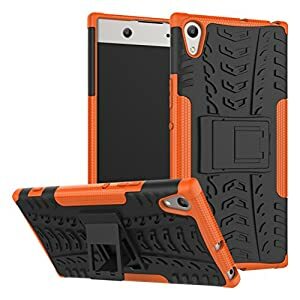 note:This phone case is not fit: SONY XPERIA XA Ultra 2016 and SONY XPERIA XA1?Only fit: SONY XPERIA XA1 Ultra 2017 and fit for:Sony G3223,thanks! Built-in foldable kickstand for hands-free movie watching, videos, pictures and more. Available in a variety of bright, fun colors. Soft shock absorption TPU inner sleeve & impact-resistant hard plastic shell back cover provide outstanding protection against drops and other impact. Corners feature double-thick TPU for extra enhanced safeguard to preserve the life of your valuable Motorola Moto Z Play Droid Smart Phone. 100% Brand New In Retail Box.